British company Ruark is well regarded by audio enthusiasts for their speaker design and sound quality. 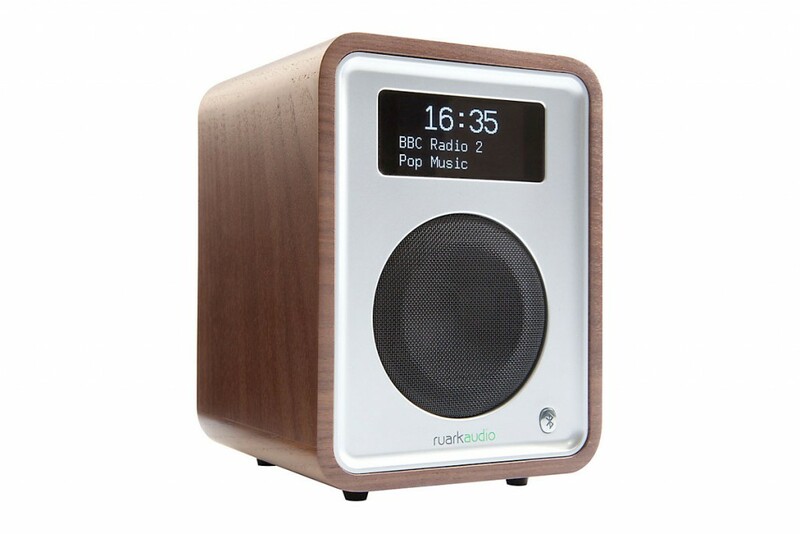 Having created their first table top radio nearly a decade ago the Ruark R1 is now in its third generation. Dominating the front of the speaker is a black speaker grill and an OLED display for the time, station name and scrolling text. Behind the speaker grill is a 3.5” high-fidelity drive unit. Where many digital radios feature numerous buttons and knobs the Ruark R1 Mk3 opts for a ‘RotoDial’ control. The controls are all found on top of the radio with the rotary knob controlling volume normally, and used for scrolling through stations when the list is viewed. The ‘RotoDial’ is pushed down to select a station. As well as FM, DAB and DAB+ the R1 Mk3 can be used as a Bluetooth speaker. Given Ruark’s credentials in sound quality it will be hard to listen to podcasts or Spotify again through the speaker on a smartphone or tablet. The clear OLED display with its digital clock and twin alarms make this an ideal radio for the bedroom. Adjustable snooze and sleep timers are welcome, as is an option to alter the display brightness in standby mode. A USB charging port is ideal for charging your phone at night. Natural materials are used in the handcrafted enclosure which lends to the sound quality. This is a technique used on higher end models from other manufacturers, but Ruark’s experience in loudspeaker design shines through here. Standard finishes include walnut veneer and white and black lacquers. Optional extras for the R1 include a ‘BackPack’ battery. For owners looking for portability the added battery doesn’t intrude on the space available for the speaker. The power pack is rechargeable and attaches to the back panel of the radio. A hand stitched leather ‘CarryPack’ case also makes the radio easy to move around and comes in black or tan. In homes with an external DAB antenna, or access to one through a communal system, the telescopic aerial can be removed. This should improve the signal received by the radio and makes the radio easier to place on bookshelves. Verdict: Ruark brings decades of experience in loudspeaker design to its newest R1 model.